There is of course the issue of the directional behavior. First of all, because the speaker is a dipole above bass frequencies, one can set it up so it is in effect sending no acoustic signal to the nearer sidewall’s first reflection point. Nothing is bouncing off the sidewall to give an early reflection. (The first reflection off the far sidewall will be set to arrive behind the listener with natural positioning.) The effect of this is that it is a long time before any reflection at all arrives at the listening position. The fact that the panel becomes more directional in the higher frequencies makes this effect all the stronger. The Sanders gives the impression of an RFZ room (reflection-free zone) without the need for building one! In short, the sound from the panel interacts with the room about as little as possible. Of course, reflections off the backwall arrive eventually, but with proper placement, this is delayed long enough as to not disturb imaging nor color the sound. As Peter Walker once explained the idea of dipole electrostatics, there is time for the brain to “sort things out” before any reflections arrive. One can get something of the resulting effect of being immersed in the recorded soundfield from box speakers by sitting really close to them, supposing they remain coherent enough at close range. But here with the Sanders, the effect of immersion remains at normal listening distances. The “sound of real music in real space” depends on giving the ear/brain time, as Walker said, to “sort things out” before there are any secondary arrivals. And here you have the time, indeed. One can also use the dbx box to adjust the response to taste as it were and also to tweak away any residual room effects that strike you as colorations. These will be minimal, given how the speaker works, but still, you might want to do something. Control of your own life is good! There is a recommended target curve, which pulls the bass up a bit relative to nominally flat (steady-state RTA flat). I too would recommend this for reasons explained in part here (regonaudio.com/Records%20and%20Reality.html). Also if you want, you can lift the response slightly in the lower part of the midrange, just above the crossover, to give the effect that a box speaker would have of filling in that region a bit more in the room sound than a pure dipole does, thus mimicking the box speaker room sound a little. Personally I was happy with the direct panel sound as such, with room-corrected lows following the “target curve.” But you have a lot of room for adjustment using the crossover box, which offers parametric EQ options. 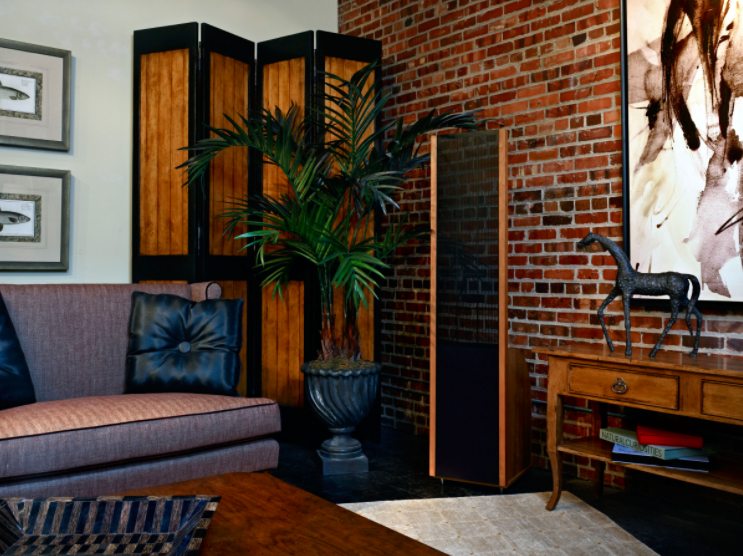 Electrostatic/box woofer hybrid speakers have become reasonably common. And quite a few of them have some sort of built-in bass-correction system. But the Sanders 10e’s have an advantage over the other ones which have curved panels. I know it is unconventional in audio reviewing to have really definite opinions about general types of speakers. “Circumstances alter cases” could well be the motto of audio reviewing. But in this case, I need, like Marc Antony, to be “a plain, blunt man” and say what I have found to be true. In experience, curved panel speakers do not image correctly. My guess is that this is because curved panels generate a time smear which does not diminish with distance, whereas as listening distance increases, all points of a flat panel approach having the same distance to the listener. This is basic geometry. If you are 100 inches from the center of a 12-inch-wide flat panel and straight out from the panel, the distance to the edge of the panel is the square root of 10,000 + 36 = 100.18. So you are only 0.18 inches farther away from the edge than from the center. At 200 inches, the difference would be 0.09 inches. But if the panel itself curved so that the edge was say 0.5 inches back of the center, then even at large distances the 0.5 inch difference would persist. Curved panel means time smear that does not go away with distance, though the audible effect of such theoretical considerations is always debatable. But whether this is the reason or not, to my ears curved panels do not generate precise images. One might interpret this lack of precision as “dimensionality,” but to my mind it is really smear. Stereo imaging is a real thing. It ought to be as precise as the material allows. The speakers ought not to smear it at all. But I admit that taste varies here. Some people really like recordings made with widely spaced microphones, which have blurred images by nature! Psychologically, imaging precision leads to an enhanced sense of resolution. Listen to some choral material on the Sanders. Because individual voices are precisely located in space, the sense of hearing them separated from each other is more natural and precise and convincing than a speaker with blurry imaging would provide. Electrostatic panels have a lot of resolution in the sense of having a pure sound with little secondary noise added. But this effect too is more convincing with the flat panels, or so I have found. Now one has to have a certain listening distance for all this to happen. Up really close, one hears to some extent the panels as distributed radiators rather than as point or line sources. But this effect goes away at normal listening distances and, since the speakers bounce so little sound off the sidewalls in early reflection, one does not need to sit really close, as one does need to do with box speakers of wide pattern—if one wants to get the sidewalls out of the sonic picture.